I’ve started receiving early Christmas presents. I love all of the presents I’ve gotten, but the one I love the most is the one my 17-year-old son made me with his own two hands. The present: a bracelet made from rubber bands. Now this bracelet is special to me for several reasons. First, he made it all by himself. DS is one of God’s special little people. He has a lot of issues, one of which is multiple developmental delays. His aunt sat with him this afternoon and used the rubber bands on his fingers to teach him how to make the bracelets by himself because that’s what he decided he wanted to do for everyone for Christmas this year (the woman is a saint I tell you). It took a little while, but he got the hang of it and ran with it. Secondly, the colors he chose are close to my heart. My mother has myeolofibrosis. The way it was explained to me is that her bone marrow is slowly turning into fibrous tissue like scar tissue (find out more about myeolofibrosis here). All I know for sure is her best shot at a cure would be a bone marrow transplant that Medicare has refused to pay for because she’s 64 years old, so she has to go for blood transfusions at least once a month. She usually has to take at least two units at a time, and this takes the better part of six hours to run into her arm, so that’s a whole day out of her life by the time she signs in and everything else. But that’s a whole different blog post to come later. 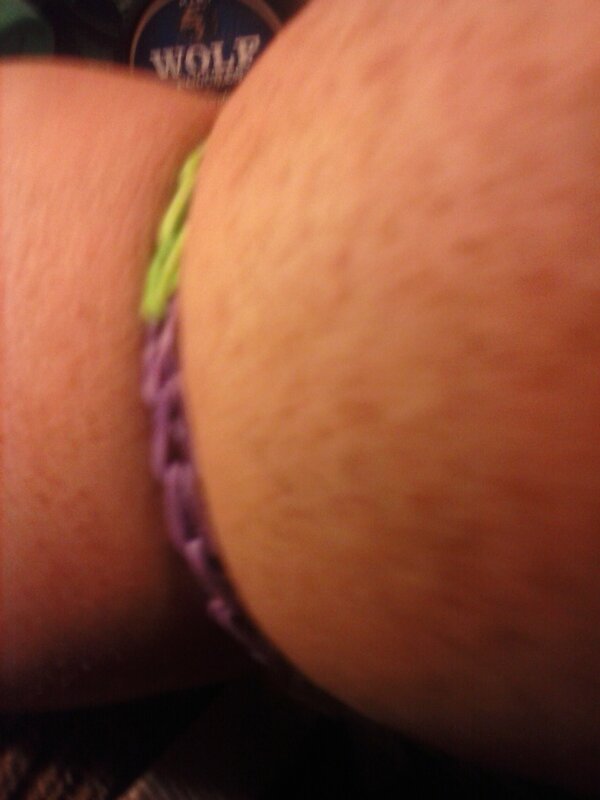 A few months back my parents got some myeolofibrosis awareness bracelets and passed them out. One of the bad things about being a fat chick is that things like that don’t usually fit me, and true to form thos bracelets didn’t either. I was heartbroken because I couldn’t wear a bracelet like the rest of the family to show my support for my mom. I cried when nobody was looking, but I put a good face on it in front of everyone, telling them that it was okay and I didn’t really mind. Well, DS remembered those bracelets were purple and green, and he made me a half purple, half green bracelet for Christmas. He went ahead and gave it to me today. It means a lot that he remembered my feelings were hurt and fixed the situation in true DS style. Yes, he gets style points for this one! Thrid, DS didn’t even have to measure my wrist to get the size right. He said he just thought about how big my arm is and made the bracelet. And it fit on the first try. Oh yes, more style points! And now I proudly unveil DS’s creation. 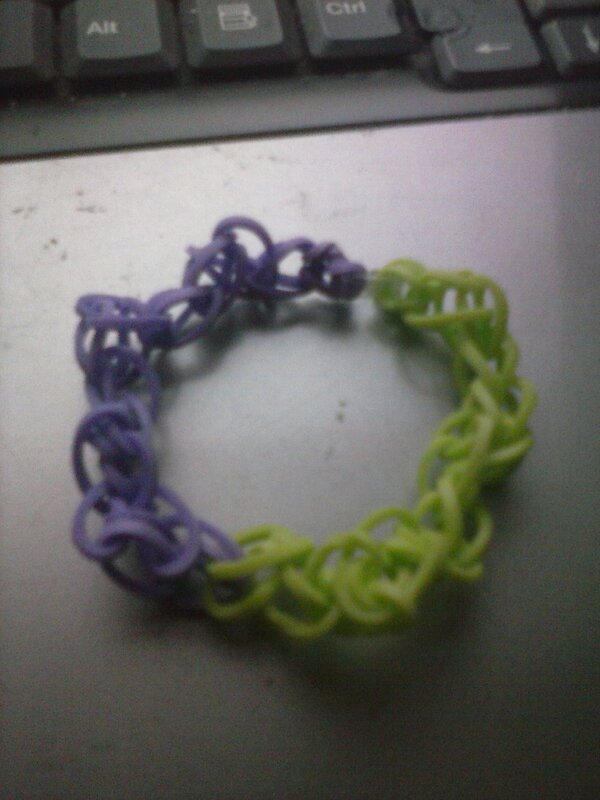 Here is the second bracelet he ever made. I couldn’t be prouder of him, and it’s my favorite Christmas present this year. Isn’t it beautiful? I’d rather have this bracelet than any made of gold or silver. It’s priceless because I may wear it on my wrist, but it lives in my heart. Have you received any Christmas presents yet this year? Would you like to share any memories of presents past? I’d love to hear them in the comments!